A substantial majority of U.S. voters – 84% – followed along as results trickled in on election night, and television was by far their most common way of tracking returns. Nearly nine-in-ten of those who followed returns (88%) did so on TV, while 48% used online platforms. About one-in-five (21%) used social networks such as Twitter or Facebook, according to a Pew Research Center post-election survey. The share of voters who tracked election returns on TV was similar to the share who did so during the last presidential election (92% in 2012, 88% this year). On the other hand, digital sources have gained ground. The share of voters who followed returns online increased by 14 percentage points since 2012 (from 34% to 48%), while the share who tracked results using a social networking site more than doubled (from 8% to 21%). Younger adults were especially likely to have turned to online sources on election night. 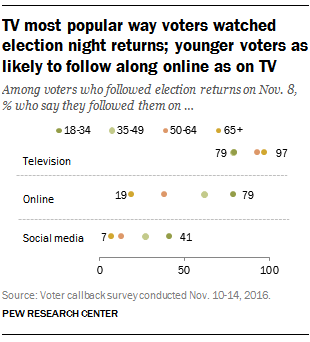 Fully 79% of voters under the age of 35 who followed the election returns did so online – identical to the share of young adults who followed them on TV. Additionally, 41% of this group followed along on social media. By comparison, just 19% of voters ages 65 and older who followed election returns did so online, and just 7% of these older voters turned to social media. Although TV remained the most popular source for election news, a growing share of voters opted to supplement their TV viewing by “dual-screening” with online sources: 37% of voters who followed the election returns used both television and the web, up from 27% in 2012. Conversely, the share of voters who followed the election results only on television fell by 14 points (from 65% to 51%). And although relatively few voters who tracked the returns said they did so only on the internet, that share has nearly doubled since 2012: This year, around one-in-ten voters who followed the returns (11%) did so only online. Again, these experiences greatly differ by age: 50% of voters under age 50 who followed election returns followed them on TV as well as online, but that share drops to 26% among voters 50 and older. And while 68% of those over 50 who followed returns said they only did so by watching TV, that compares with just 28% of those under 50. In addition to surveying voters on the types of platforms they used to watch election results, Pew Research Center also asked with whom voters watched the returns. A majority of voters who kept up with election returns (79%) did so by themselves or with family, while 14% reported they followed along with friends, and 6% watched with both friends and family.